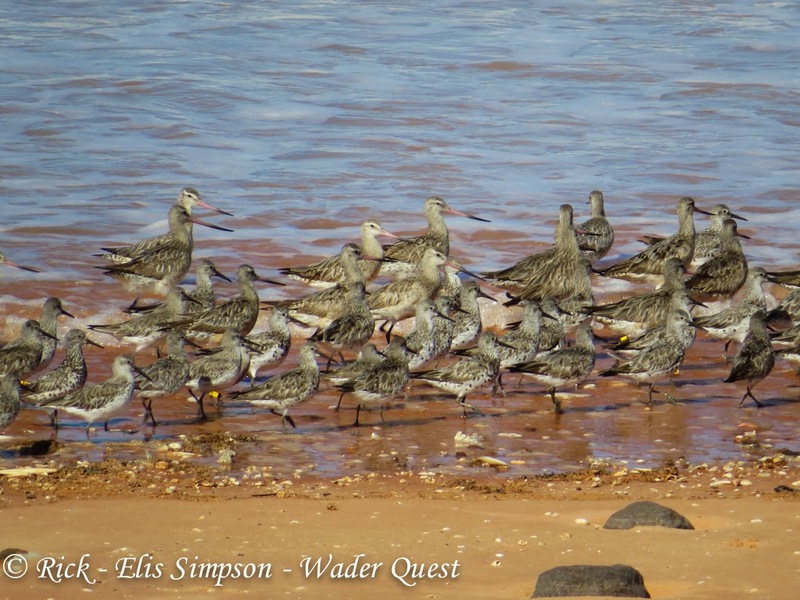 It is now some days since the first Great Knot carrying a satellite transmitter (PTT) left Roebuck Bay for the first leg of its migration to the breeding grounds. Great Knot Calidris tenuirostris. Broome, Western Australia, Australia. September 2013. It has now been joined by six more all winging their way north; six are on the Chinese coast and one, the latest one to leave, is 370km north of Roebuck Bay over the Timor Sea. Three Great Knots flew directly to Zhejiang Province and are in bays 200km apart. This is a flight of 5,200km. They took about 4 days so were averaging about 54kmph. One of these birds went 200km inland when it reached the Chinese coast but then swung round and landed on the coast. This track certainly surprised us! Great Knot Calidris tenuirostris. Pah Thale, Phetchaburi, Thailand. November 2012. The most northerly bird is just south of Ningbo city (30 11 55N, 121 50 33E). It did not go there in a direct flight but stopped for eleven days 1,050km south of its present site. In total six birds are on the Chinese coast from Dongliao Dao (21 01 47N, 110 23 06E) to Hangzhou Bay (30 11 55N, 121 50 33E) these sites are 1,530km apart (in a direct line). One of these birds took a 'few days off’ in Vietnam after an initial flight of 3,700km before taking a 950km ‘hop’ to Dongliao Dao just north of Hainan Island. One bird is still at 80 Mile Beach but has roamed a full 150km of the beach (the beach is 220km long!). Great Knot Calidris tenuirostris. Cairns, Queensland, Australia. September 2013. Our first Bar-tailed Godwit has also started her (all our Bar-tailed Godwits with PTT’s are females) northward journey, she left Roebuck Bay’s northern shores at 9 am (not the usual time for a migratory departure) on April 6th. She sent her last signal to the satellite (of this transmission period) from 3,400km north of Roebuck Bay travelling at a steady 50kmph. For those of you in to the modern world, you can follow more regular, brief updates on various Facebook pages and Weibo. Bar-tailed Godwit Limosa lapponica . Broome, Western Australia, Australia. September 2013. Please share with your networks and let the world know of the brilliant birds we have on our doorstep here in Broome. They are ‘our’ birds for about 7 months of the year but we share them with many other countries in the East Asian-Australasian Flyway so let everyone know. 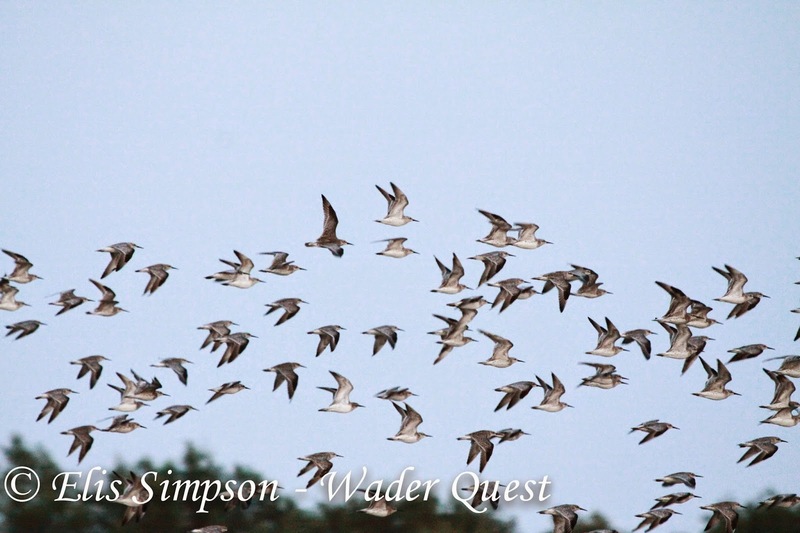 Due to the micro-blog in Chinese we have received lots of records of Great Knot flocks from many sites along the coast and we even have an image of a Great Knot PTT 41 in flight! How brilliant is that? Note: All distances and flight times in this update are preliminary. Further statistical analysis will be done at a later stage. So all information in this document is approximate. The GFN Satellite Telemetry Team. Bar-tailed Godwit Limosa lapponica and Great Knot Calidris tenuirostris. Broome, Western Australia, Australia. September 2013.